Today is the 30th day of Migraine and Headache Awareness Month and Day 30 of our MHAM Blogging Challenge. Sharing Hope: Share your favorite blog challenge post from this month, yours or somebody else's. The best way for mood enhancement is to do this is to quote the first two paragraphs from the post and link to the rest of it. Then tell us why it's your favorite. 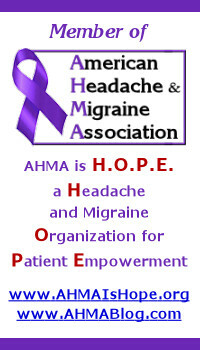 Today is the 29th day of Migraine and Headache Awareness Month and Day 29 of our MHAM Blogging Challenge. What IS Hope? : We left his one for late in the month so everyone would have been thinking about hope. This one may be one of the more challenging prompts for you, or it may be one of the easiest. Please define hope. Tell us what it is to you, and what it isn't. Today is the 28th day of Migraine and Headache Awareness Month and Day 28 of our MHAM Blogging Challenge. "Hope Begins In the Dark," Interpret the Quote: Tell us what the quote on the image below means to you. We'll be posting more about this year's American Headache and Migraine Association patient conference soon, but for everyone who's anxious to see the group photo, I wanted to get it up now. I also want to take this opportunity to thank everyone who spoke at the conference, helped set it up and keep it going, and everyone who attended. It was a wonderful day spent with others who have cluster headaches, migraine, or another headache disorder as well as family members and friends who cared enough to attend. Today is the 27th day of Migraine and Headache Awareness Month and Day 27 of our MHAM Blogging Challenge. "You Are Loved (Don't Give Up)" Watch the Josh Grogan video below and listen to the lyrics. How does it make you feel? Which lyrics do you find especially inspiring? If you want to embed the video in your post, you can find it on YouTube. Today is the 26th day of Migraine and Headache Awareness Month and Day 26 of our MHAM Blogging Challenge. Choose your own hope topic: Please choose your own topic related to living with hope and write about it. Today is the 25th day of Migraine and Headache Awareness Month and Day 25 of our MHAM Blogging Challenge. "YOUR Hope," What do you hope for most in your journey with Headaches or Migraines? Please share with us about what you hope for and why. Today is the 24th day of Migraine and Headache Awareness Month and Day 24 of our MHAM Blogging Challenge. "Fighter" Have your Migraines or Headaches made you a fighter? : Watch the Christina Aguilera video below and listen to the song lyrics. How have your Migraines or Headaches made you a fighter? If you want to embed the video in your post, it's available on YouTube. Today is the 23rd day of Migraine and Headache Awareness Month and Day 23 of our MHAM Blogging Challenge. Hope for a Cure? : Do you have hope that a cure will be found for your Headache disorder? Tell us about your hope. Today is the 22nd and Day 22 of our MHAM Blogging Challenge. "The Power of Friendship" From the image below, please tell us how the power of friendship helps you maintain hope. You may use this image as long as you make no changes to it.